All-day lunch menu when breakfast finishes. 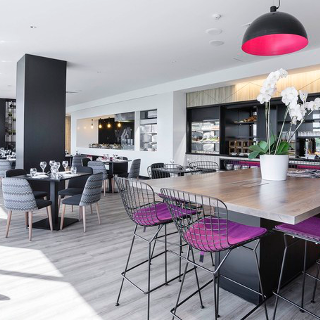 Mercure's newly renovated restaurant overlooks the Brisbane river and stunning South Bank Parklands. Serving a wide array of dishes from multiple cuisine's we pride our self on having a meal to suit everyone with vegetarian, gluten and dairy free options available. Re athmosphete: I’m very happy to see the nice little changes happening, like the vines or the black cutlery. I think the restaurant could benefit from more indirect lighting. Maybe use the pillars? We really enjoyed our food and drinks and we were seated with wonderful views of the Brisbane river. The staff were friendly but more attention to our needs would have been appreciated. A great place to visit or take visitors. Excellent main coarses and wonderful deserts. Staff is very friendly. Thoroughly recommend this restaurant. Enjoyed a lovely dinner at Mrepublic Restaurant. The staff were very polite and attentive and really made our experience extra special. The meals were very inviting and flavoursome and we all enjoyed our evening. Thank you. Staff were efficient, friendly and attentive. Meal was very good. Great flavour and reasonable size serving and price. A very pleasant dinner, with interesting cuisine. We had an excellent night celebrating my son’s engagement. The service and food was excellent. Thoroughly recommend this restaurant. We tried The  Lamb and The pear and Charcoal toast. Both were very original and tasty. the service was very good, we were looked after so well. We would like to thank you all very much for making my mums 70th birthday a fantastic night with great food and service. Would come back again. Knowledge of menu by staff was limited. Meals were not as described on menu . Food was adequate. I looked at the dinner menu before booking, not the lunch menu. If I had, I would have booked elsewhere as it is just burgers and pizza. Nothing really worth going there for. What really annoyed me was the outrageous price of parking. $83:00 for lunch, and $62.50 EACH for TWO HOURS of parking. I had two guests, who left whilst I was paying for the meal, we were all in seperate cars. I was horrified at the extortionate rates, and called them both to apologise for not knowing. We came din in with our two children, on arrival, @18:05, we asked to have a child spaghetti serve asap, spaghetti only with no sauce. It took close to 30mins to serve on the table. From the moment we ordered our meal, @18:10 there were two other table in the restaurant, which has placed their order already. We ordered two fish dish on the menu, it served on our table @19:00 with missing ingredients, it mean to come with grill prawn, yet manager apologized since is the first day for the new menu to roll out... we are putting a big question mark on how capable a chief is to manage a big hotel chain restaurant? Services is extremely slow. It’s a torch to din in when you come with children. Great food (very generous sized meals! ), friendly, helpful service, lovely atmosphere. Thanks for making our celebration lunch special! Seafood disappointing, frozen, especially the snapper which looked a nice fillet but freshness and taste was missing, sad to eat a bland and rubbery fillet. Had a fish meal the next night at another Brisbane restaurant - entirely different, the fillet was fresh, glistening, obviously treated well by the chef and the result was taste, flavour - as I would expect.